located in my home town ... the Silver City of the Nutmeg / Constitution State. You may also find additional Net content arranged in alpha / category formats. This feature is created as a result of several visitors' input / suggestions. My goal is to provide a growing and valuable local resource for all to enjoy. 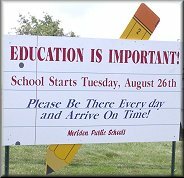 that school begins each year before the labor day holiday! upcoming class reunion events by reviewing the local details on-line. Even those with family gatherings and/or special anniversaries benefit!